Ace Natural efforts toward a cleaner and more sustainable food supply chain started back in 1994 and have been strengthening every single year. We are extremely discerning of our food sources. We only distribute the cleanest healthiest and safest possible ingredients made with integrity by our farmers and suppliers. 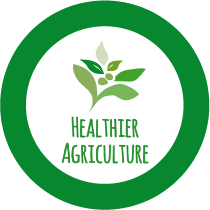 We believe in a small and fragmented food system therefore try hard to provide opportunity and market visibility to products from small farmers and producers. We believe in locally sourced ingredients.The shorter the distance the food travels, the healthier, safer and more sustainable it is. At Ace Natural we develop partnerships with local manufacturers and also with local farmers to provide beautiful seasonal products as much as possible. We do business with people with whom we share the same vision of a better world through organic, cleaner and safer agriculture.